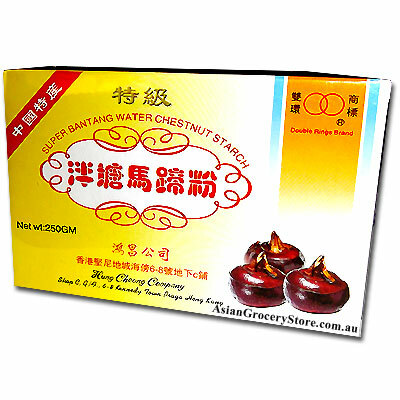 Minimum quantity for "Double Rings Water Chestnut Starch" is 1. Ingredient: Water Chestnut Starch: 250 gram, dark Brown Sugar: 500 gram, Water: 1350mL (about 4 Rice Bowls). 2) Boil 850mL of water in a large pot, add brown sugar until it was dissolved. Cool down the syrup for 10 minutes and pour the water chestnut liquid, keep stiring while pouring until it becomes to a medium cooked conditions. 3) Pour the mixture into a cake pan and steam for 25 minutes, cool down the water chestnut cake. 4) Can be served hot or cold (for hot serve, fry each slice of water chestnut cake for 30 seconds on each side).